Bells at virtually all Armenian churches around the world rang 100 times on Thursday night at the end of a special ceremony at Holy Echmiadzin canonizing the victims of the Ottoman-era Genocide – the first such rite conducted by the Armenian Apostolic Church in 400 years. The procedure administered jointly by His Holiness Karekin II, the Supreme Patriarch and Catholicos of All Armenians, and Catholicos Aram I, of the Great House of Cilicia, and attended by Armenian President Serzh Sargsyan, other high-ranking dignitaries and guests, ended at 7.15 pm Yerevan time sharp (or 19.15 on the 24-hour clock) symbolizing the year (1915) when the Ottoman Empire’s genocidal policy against Armenians began. More than 1.5 million Armenians lost their lives in the World War I-era killings and deportations in Ottoman Turkey that amounted to the first genocide of the 20th century. 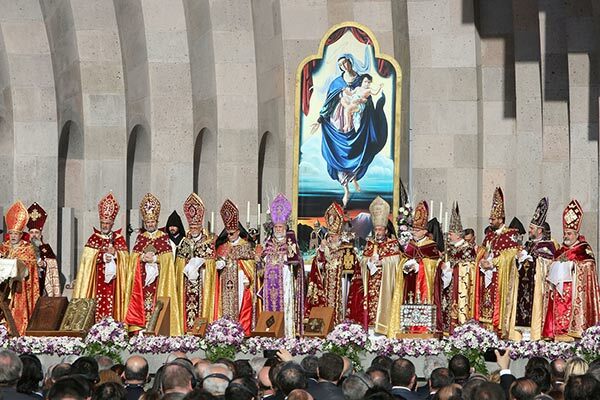 The Armenian Church says that by the canonization of the Genocide victims it does not indicate the specific number of victims, distinguish their spiritual deeds or give the names of the individuals, but proclaims the collective martyrdom of those who were killed for the sake of their faith and their homeland. Turkey denies that the killings were a deliberate Ottoman government effort to exterminate Armenians as a people. After the ceremony, His Holiness Karekin II, Catholicos of All Armenians, and Catholicos Aram I, of the Great House of Cilicia sent a massage of blessing to the presents and to the whole nation on this occasion. “During the dire years of the Genocide of the Armenians, millions of our people were uprooted and massacred in a premeditated manner, passed through fire and sword, tasted the bitter fruits of torture and sorrow. Nevertheless, in the midst of horrid torments and facing death, remained strengthened by the love of Christ, bringing the witness of unshakable faith, in accord with the apostolic words, “If you are reviled for the name of Christ, you are blessed, because… the Spirit of God is resting on you.”"
Only Armenian churches in Turkey did not join the April 23 chime for the canonized Genocide Martyrs (but the Armenian Patriarchy of Constantinople (Istanbul) plans a special liturgy on April 24). In contrast, many non-Armenian churches did join the bell-ringing.Among them were also the Notre-Dame Cathedrals of Paris and Strasbourg, the Cathedral of Christ the Savior in Moscow, the Buenos Aires Cathedral, St. Patrick’s Cathedral in New York and others.